Are you bored? Do you wonder what to do today? So why not go to the cinema? See what new to watch, starting from today! A story for love and life decisions, this movie directed by Kanai Junichi will let you in a world, full of love and hate. In this movie you can also see Asaka Mayumi, Dankan, Araki Yuko etc. Another choise for this evening can be also the movie “Pekorosu no Haha ni Ai ni Iku”, which story is about a manga writer Okano Yuichi, who begins writing nurse notes while taking care of his mother, who is afflicted with Alzheimer’s disease.Main role is played by the famous actor Iwamatsu Ryo, known from movies and dramas like “Kisarazu Cats Eye”, “Tokyo Tower”, “GM: Odore Doctor” and many others. 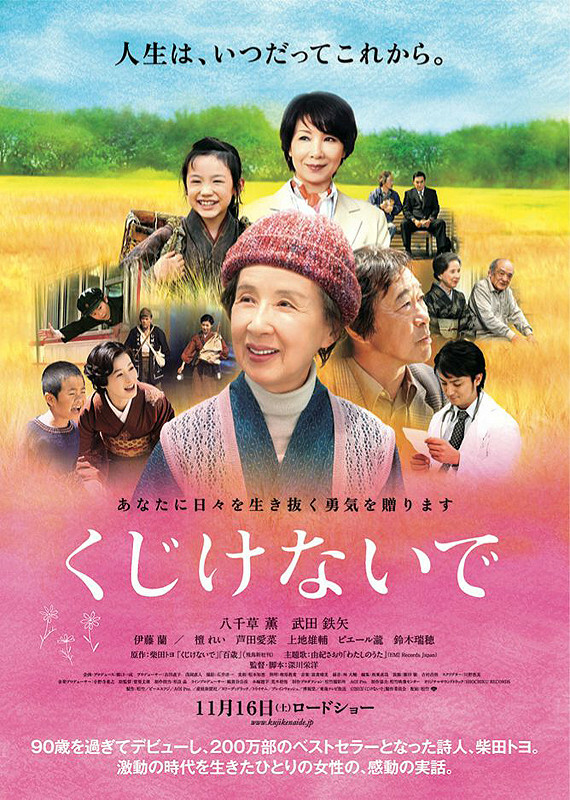 The role of his mother is played by Baisho Mitsuko (“Ashita no Joe”). Takenaka Naoto is also playing in this movie as Yuichi’s friend. “Jinx!! !” – firstly aired in 20th October at Tokyo International Film Festival, now will be officially announced to the public. The story is about Kaede (Shimizu Kurumi) and Yusuke (Yamazaki Kento), who have feelings for each other, but they do not express their feeling honestly. Ji-Ho (Hyomin), who is an exchange student from South Korea, gets to know Kaede and Yusuke while attending university. Ji-Ho notices the feelings held by Kaede and Yusuke for each other, so Ji-Ho introduces a Korean style romance and leads Kaede and Yusuke to love. Interesting story with well chosen cast this movie is recommended. Kumazawa Naoto – screenwriter and director of the movie – really knows how to entertain the public, especially younger one. Other choice for the big audience is the movie “Kujikenaide” also known as “Don’t Lose Heart”. It depicts the life of best-selling Japanese poet Shibata Toyo. Shibata Toyo first began writing poems at the age of 92 and published her first collection of poems “Kujikenaide” (″Don’t lose heart″) in 2009, which sold over 1.5 million copies. Main role is played by Yachigusa Kaoru. Other cast is also very well chosen, as there are stars like Takeda Tetsuya, Ashida Mana, Kamiji Yusuke and Suzuki Mizuho. Cast of the movie as well are actors Sasaki Kokone, Yue Takeyuki, Kubota Yuki, Kanayama Kazuhiko etc. 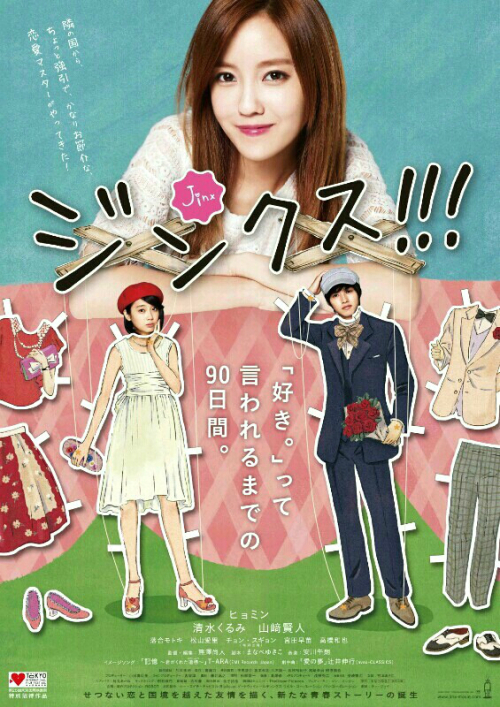 “Shinokubo Story” is again movie with Korean wave in it. 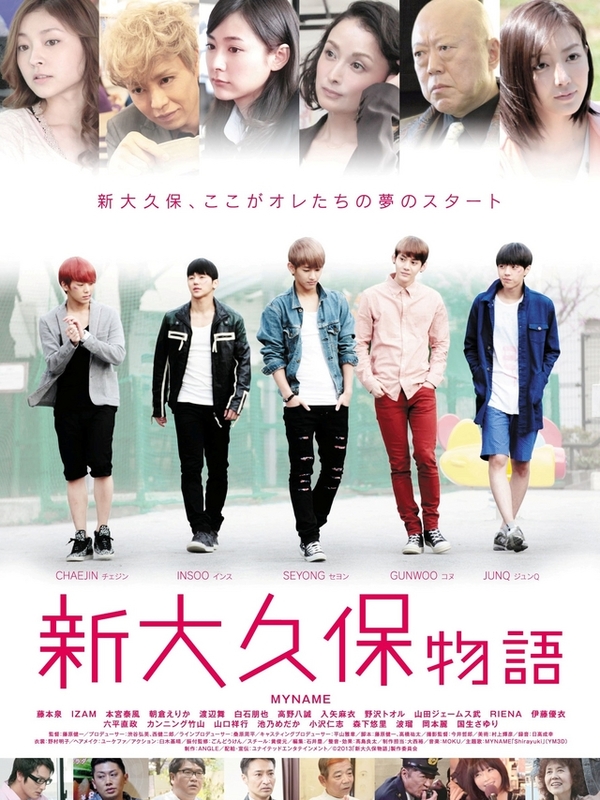 The main male roles are played by the members of the Korean band “My Name”. ChaeJin wants to work in the entertainment field, but he currently works as a tour guide. InSoo also works as a as guide, but isn’t content with his job either. InSoo doesn’t know exactly what he wants to do. Meanwhile, Gunwoo and JunQ are members of an upstart Korean band named “NOBODYS,” but their group fails to make their debut in South Korea. To find a way out, they travel to Japan. SeYong is a talented performer and member of “NOBODYS”. He also travels to Japan to get his back treated. Utako works for an entertainment company. She knows of Gunwoo and JunQ through a friend and hopes to have them debut as a K-Pop group from Shin-Okubo. She proposes her idea to her company president, but the president doesn’t seem very fond of her proposal. By chance, Kotoko meets InSoo, ChaeJin, Gunwoo, JunQ and SeYong. She sees that the boys have some potential and agrees to allow them make their debut in Japan if they join together as a group. Problems though arise as InSoo’s yakuza father forbids him from doing so and SeYong is told to focus on receiving treatment for his backache. Yet, Utako is busy making plans for the group’s debut. She names the group “MYNAME”.